We’re excited to announce that we just planted twelve new dwarf lychee trees around the perimeter of Sunset Meadow. This is one of our favorite fruit trees, and we’re so excited to be adding this variety to our existing fruit tree collection at Sunset Ranch. 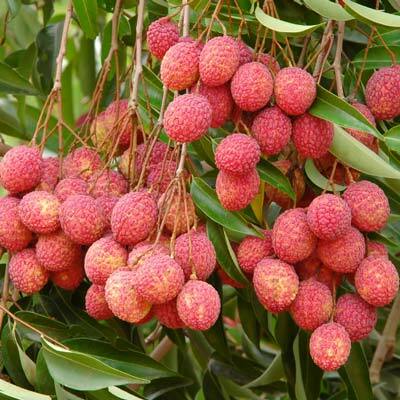 As many of you may be aware, lychee is a tropical and subtropical fruit native to China, and now successfully cultivated in many parts of the world. Lychee has a beautiful brightly colored pinkish / reddish hard shell with a delicate, white pulpy fruit interior. Due to the flavor often being lost in the canning process, lychee is most often eaten fresh from the shell. Lychees are used in a variety of dessert dishes, including ice cream – our favorite!